City Splits is a new series presented by monika enterprise. Whereas monika’s 4 Women No Cry series, currently on its 3rd acclaimed volume, is designed to unite artists divided geographically, City Splits will instead focus on one city and present two of the most exciting new musicians from that scene. Having recently celebrated the 20th anniversary of reunification and the fall of the Wall, Berlin was a logical choice for the 1st installment of City Splits: #1 presents two interesting female musician-producers who live and work in the German capital. What Golden Diskó Ship and Jasmina Maschina have in common, other than the fact that they tour as a double-bill each not only supporting but playing on stage with the other, is their standing in the berlin scene. Despite their very different musical styles they both have strong followings certainly in their home towns and, looking at their relentless tour-schedule, presumably from further a field too. Golden Diskó Ship aka Theresa Stroetges started playing songs live on her laptop since the moment she first arrived in berlin in 2007 and at the same time commenced 3 years of touring, hand made CDs, and music video production to accompany the live shows. The 27 year old sound sculptress has quickly become renowned for her imaginative blend of fragile balladry, novel use of found objects, crunchy distortion, quirky visuals and squealing bits that suggest horrific drum machine abuse. Firmly rooted in the DIY tradition, Golden Diskó Ship has to date had a number of self-releases, the Bumblebee Behind A Tree EP (2007) & Lonesome Cowboy/Christmas Tree EP (2008). She has already gained considerable attention from the press with comparisons to d_rradio and FOURTET. The “organically cluttered singer-songwriter” lists her influences as including restlessness, chocolate, first takes, peaceful hangovers, lakes, trees, streets, bad weather, swimming pools, mistuned guitars and iceland - where she lived for 1 year. Indeed the name Golden Disko Ship comes from a rotting former party ship in the harbour of Rekyavik. Her uniquely chaotic and original music with its fragile layers of magnificently swirling sounds has fast made Golden Diskó Ship a favourite of the Berlin underground-indie scene. Jasmine Guffond aka Jasmina Maschina is a celebrated Australian electronic musician who relocated to Berlin from Sydney in 2003 with her band MINIT (sigma editions). Over the last 10 years Jasmine has been recording and performing with Minit, exhibiting sound installations, developing works of varied scope based on the use of processed acoustic, electronic, and found sound sources. Equally interested in song, composition and free, improvised music, as Jasmina Maschina she began recording songs in her myriad of Berlin homes producing her debut solo album, 'The Demolitions Series' which was released on Staubgold in 2008. Since then she has been playing throughout Europe, further developing her studio recordings with musicians Theresa Stroetges (guitar, viola, glockenspiel, high hat, zither) and Steve Heather (drums on ‘City Fever’) and all the time recording new music at home, and working with Theresa Stroetges who plays Viola by on ‘Holding Onto Day’ & ‘You Come And Go As You Please’. The most recent recording, Ausland originates form a live solo electronic performance at Ausland Club in Berlin, then developed into a variation of Slow Walker, a song from the Demolition Series. For City Splits #1 Gudrun Gut has hand picked 5 of these recordings (plus a bonus track on the download). 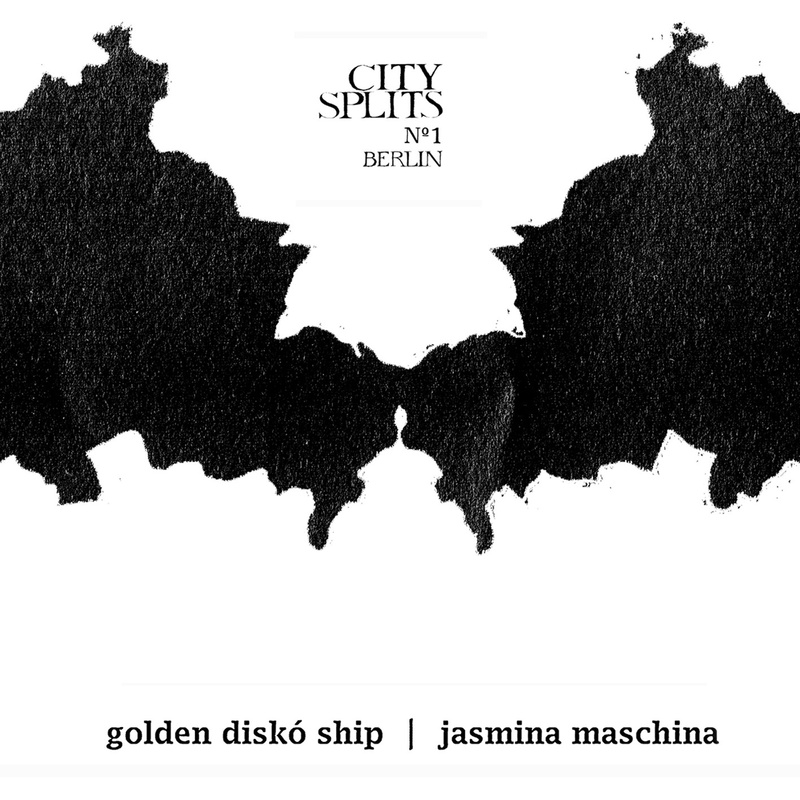 With a trip to LA already planned for #2, City Splits offers a fresh take on the urban musical landscape and the Golden Diskó Ship / Jasmina Maschina record is a beautiful first leap into uncharted waters. In this difficult day and age where music is often taken for granted, monika for one is still not afraid to delve into the unknown and support new talents.